Cadet Day Day Poe is congratulated by Lt. Col. Gary Love, chair of NU’s military science department, for receiving the CIET Award during the ROTC awards ceremony on Nov. 16. 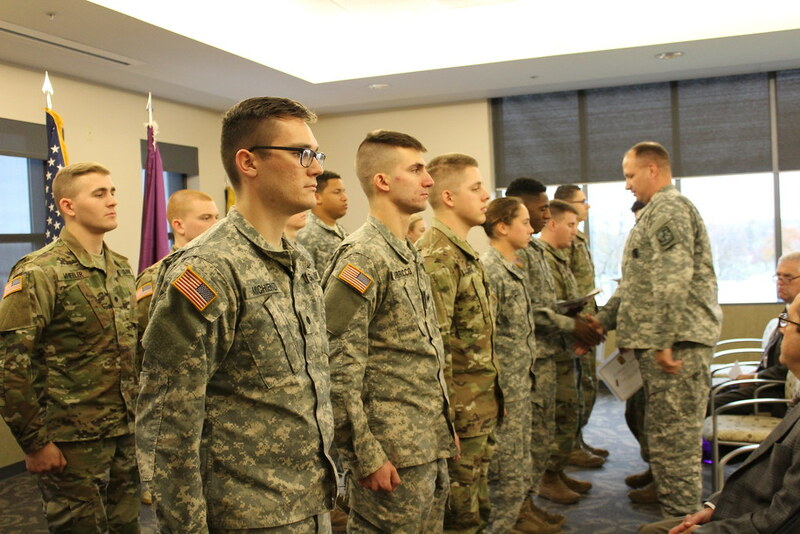 The Niagara University ROTC program held its annual fall awards ceremony in Bisgrove Hall on Nov. 16, 2017. Dr. Timothy Ireland, Niagara University’s provost, served as the event’s guest speaker. In addition, the ROTC program announced that Daniel Kelly and Douglas Urban are newly contracted cadets. To learn more about the Niagara University ROTC program, please visit http://purple.niagara.edu/rotc. Photos by Megan Held, a senior education major at Niagara University.